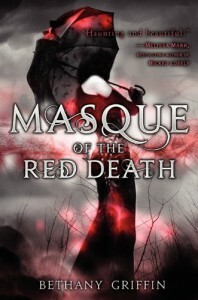 Masque of the Red Death is based off of an Edward Allen Poe short story. I had no idea of that until I finished and was looking it up to shelve it. I'll have to read it at some point now but at this time, I have no idea on how they relate. Araby Worth lives with the elite. Their world is crumbling due to a plague. People walk around with masks on to protect themselves and Araby's father designed the system. Therefore she lives in the nice area of town and has numerous masks for different occasions. But she still grieves for the loss of her twin brother and vows never to do anything he wasn't able to do. She distracts herself with drugs and alcohol from a club she visits. After a bit of this, the plot does start and involves the villanous Prince Prospero who controls the city and two groups working to overthrow him. There is also a love triangle between Araby and the owner of the club who struggles to make ends meet for his younger siblings and the brother of her friend who needs her help to change the system. I'm a bit mixed on the book. It was more on the okay-guess I liked it scale. There's only one book after this so I may pick it up just to finish it.